Gauhati High Court Stenographer Admit Card 2018 Grade II & III IV Exam: The High Court of Assam, Nagaland, Mizoram, and Arunachal Pradesh, will conduct a written exam for Stenographer Grade II and III posts on 29th April. The exam date is tentative officially and the authority is going to upload Gauhati High Court Stenographer Admit Card 2018 online. GHC Steno Grade II & III IV Exam Date is announced and may change as per the authority’s decision. Dear applicants, read further to have your ghconline.gov.in admit card online now. The recruitment authority had invited eligible candidates for filling 97 vacancies in the state judicial authorities of Nagaland, Mizoram, Assam, and Arunachal Pradesh. All the seats are to be filled for Stenographer posts covering Grade II and III. The main thing to note here is that the selection process comprises of Written Test, Typing/Skill Test, and Interview which are mandatory to clear in order to qualify. The main and primary step is to obtain and print your GHC Admit Card to examination halls. 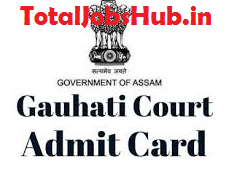 The recent news regarding Gauhati High Court Stenographer Admit Card 2018 is available here. Those who are willing to attend this examination will be able to receive their Hall Tickets at least 7-8 days before. Kindly, remain in touch with this portal and refer to the following update sections to get all the relevant details about the oncoming test. The description is also provided below. Profiles Vacant: Stenographer Grade II and III. Please note that the Gauhati High Court Steno Grade II III IV Admit Card is conveyed through the admit card. Besides the date and timing contestants are instructed to check other information such as exam venue, exam pattern, instructions to follow and valid photo and signature. Aspirants can also check the examination pattern followed for this recruitment. Verify the same in the official notification before preparing for revision. The written and typing tests will be held as per the examination syllabus stated here. Note: Final Selection is based on order of Merit considering the categories and highest percentile obtained altogether in Stenography Test and Viva-voce. Examinees need to obtain a separate copy of their hall ticket to carry to the examination hall along with an original Identity proof which can be either Driving License, Voter Card, Passport Aadhaar Card, or PAN Card. Kindly, reach the examination centres timely because late entrants will not be permitted to enter the premises after a deadline. Use of calculators, electronic support, mobiles/smartphones/, digital/smartwatches is prohibited inside the examination hall. Those found guilty will be penalized as per the rules and policies of the recruiting body. Make way to the official web media first of all which is, “ghconline.gov.in” and locate the recruitment section. Find a recently highlighted link with respect to the upcoming exam and follow it. Reach the login page and type your Registration Number and Password. Press the submit button and obtain your hall ticket. Generate its printed version and keep one copy secure for future uses. Please take help from the guidelines stated above and proceed as told to gain access to GHC Steno Grade II & III IV Admit Card. More relevant details are available online and candidates are advised to visit here regularly in this regard. Check the verified link that is also given hereunder. For further concerns or queries, contact the admin via the comments box.